When the temperatures rise, one of the most uncomfortable things can be your shoes – particularly when dressing informally. The key to keeping cool is to have light, preferably unlined shoes, and wear them without full socks wherever possible. The summer staple for tailoring, preferably in suede. Dark brown is the most versatile, followed by tan. The more casual the loafer, the more suited it is to summer clothing and to wearing without socks. And as a general guide suede is more casual than leather, paler colours are more casual than dark. Having loafers unlined makes them cooler and lighter, but be aware that they will stretch more without that lining (and side stiffeners). So buy a snug size, and watch for any odd bumps where your joints push against the side of the shoe. That can ruin the line. My favourites are from Edward Green, but Lobb and Carmina (pictured top) also make great models. The best shoe for the beach, and to/from the beach, espadrilles are light, breathable and cheap. Sandals can be simple and well-designed, but men always look better in shoes. My favourites are from Zabattigli di Capri, but espadrilles are pretty cheap to make and anything found on location will suffice. Just avoid paying for a designer brand. The construction and soft rubber sole of a boat shoe makes it a great option with shorts – similar to trainers (such as my Common Projects), but both lighter and easier to wear without socks. I love driving shoes, but they should be worn at home. Unless you have a genuine problem with driving in normal shoes. If worn outside, the rubber nubs will quickly wear away and the leather begin to be destroyed. If you care at all about having and looking after good shoes, do not wear drivers outside. You can follow the discussion on The best shoes for summer by entering your email address in the box below. You will then receive an email every time a new comment is added. These will also contain a link to a page where you can stop the alerts, and remove all of your related data from the site. Agreed on the driver shoes – the fit is very comfortable, but after walking around for half a day my feet really start to hurt from the lack of the support the shoes offer. I find that Car-Shoes (I think from Prada) are pretty durable. Getting a pair (either from there or Tod’s) with the full rubber sole adds more structure and stops one feeling the nubs through the sole of the shoe. With a full rubber sole it’s more similar to a boat shoe, yes. But with nubs, even with rotation, the shoe is going to be destroyed much quicker than necessary. I know one reader commented last year that he saw Tod’s as a throwaway shoe to be worn for just one summer, but that’s obviously not my attitude. On the subject of socks in summer, my greatest discovery of late has been pure linen socks by Bresciani – a revelation. They are better than not wearing socks at all. Also, don’t forget to run your orange Crocs through the dishwasher at least weekly. Re Tod’s for the season: If you buy a shoe to throw away, you’re intending to put no effort in upkeep, which means that the shoe will look best out of the box and increasingly terrible as the “summer” gets on. So for at least half a “summer”, one would be walking around with ratty shoes. Looks crap, waste of money – I don’t see the point. Simon, I take it from the fairly positive comments about deck shoes you have changed your opinion from 2008? For me if you are going to wear any boating shoe they must have white rubber soles for which they were originally designed. If anyone should question why, try walking over the deck of a friends new sailboat in deck shoes with a brown sole. Then either pay for the re-waxing or get a new friend. I also think the line of a deck shoe is ruined by a dark leather sole. I had some great Timberland deck shoes (when timberland made very good products) and would agree with you that going say a half size smaller than formal shoes helps. However by doing that I found the bumps problem got worse and by the end of the year, even with feeding and some polish they still looked out of shape. You pays your money and takes your choice. Can simon or anyone else recommend a good make of boat / deck shoes? Quoddy shoes look the best, in my opinion, and are handmade. If you actually want to get on a boat, Dubarry make sturdy shoes with great grip (which is the most important thing). I have done a lot of sailing on wooden yachts in my youth and after Timberland and Sebago qualities went south, I found the Dubarry boat shoes reliable – though again, that was about 10+ years ago when they were still made in Ireland. I should add that I currently have Quoddy shoes, but I suspect they’re a little preciously constructed and wouldn’t enjoy the kind of beating they’d endure on a deck. There are two types of deck/boat shoe and I am not sure what you want. I have spent time around boaty people (who have much more money than me) and for real deck work they tend to use something like a clipper boat shoe or a Figawi2 high side by Sperry (I think). these both look more like a technical trainer with mesh than a traditional deck shoe. For getting that “look” I don’t think you have to spend a fortune, though Ralph Lauren does a very nice boat shoe but they tend to be in two tone. In the boating community the two brands that seem to stand out for dress deck shoes are West Marine and Chatham. The West Marine Deluxe is a very nice traditional boat shoe but the leather is rather heavy and to my eye just a little clunky. Chatham are as good as you can get in RTW for £100 to £150 (I think). Mrs B just bought me a pair of their Portland in suede (taupe) for a birthday present and, a sever, her taste is immaculate. How they last is another matter but I have to say for a preppy type look, taupe suede boat shoes, chinos and a blazer _ I mean what’s not to love! Sperry Topsiders are the original boat shoe, which have spawned many copiers. Love my quoddys. I prefer the crepe soles to vibram but crepe isn’t exactly the classic boat shoe sole. Alden and lobb are both great for loafers. 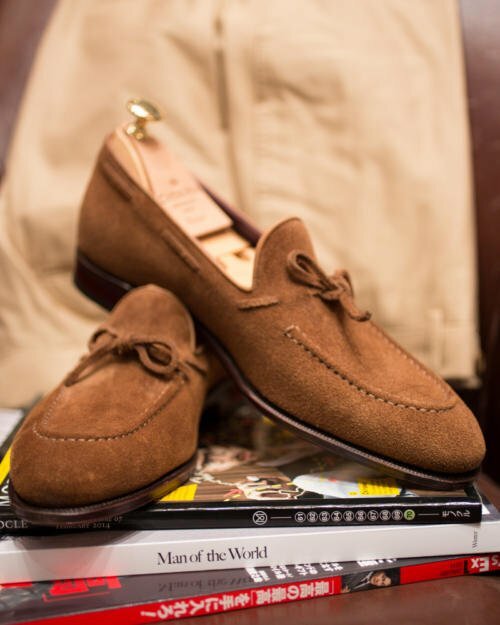 Otherwise I agree with Simon….edward green unlined loafers in tobacco suede are still kings of the hill…. First of all, big fan of your blog – you have done some serious damage to my personal finance! My initial thought is burgundy (dark purple) in the front half, and tweed on the shaft. What colour of tweed do you reckon would work? Also, being a bit greedy, I am thinking of doing a “three-tone” by using another colour on the strip of leather where the eyelets are. Do you think this is viable without leading to a colour explosion? Hey – I think if you’re going to go for three materials, they need to pretty conservative. So a dark colour for the tweed, and something dark but harmonious in the eyelet leather – maybe black, with a grey tweed? It’s easy to get excited about MTO options, but remember that this is your most expensive pair of shoes (I assume) and it needs to be something you will wear. Ducker & Son at Oxford have had/have a lovely bunch of summer loafers out this year, they had two models, a ‘monk strap’ or a penny loafer in suede. I liked them as they were unlined/structured, like a driver, but with a welted leather sole. I did not find the Monk Strap appealing, but the penny loafer (blue or dark brown) were great. I bought two pairs for myself, one in each colour. The best part is that they were selling just barely over a hundred pounds. Thanks Charlie. Do you know where the Ducker & Son shoes are made? Sorry Simon, I’m afraid I didn’t think to ask. I checked the shoes (and box) but it doesn’t say. I believe they aren’t being made in country though, as the sizing is European rather than British. I can say, though, that the quality seems quite high. The suede used is really beautiful, and the soles are well stitched, they aren’t bespoke… But I’d put the stitching and leather in the league of Crocket & jones, or pre-Prada Church’s… Which I think is saying something. Then again, these are unlined suede loafers –not an oxford or a balmoral boot. Also, I forgot to add, they also had some Gucci-esque horse but loafers as well. Not my style, but the mustard colour suede I found quite striking. Here is a conundrum, sandals ?? I like Hermes designs but they are little pricey, even for me..
Simon – random but related to shoes at least. I really struggle with laces. I prefer thin guage with a waxy finish. Ive tried established west end shoe retailers as well as cobblers at train stations but they only ever seem to last a few months. What does it take to get good laces? I’m not sure about the Loafer but great post. I actually have those shoes, (pictured) . They are extremely comfortable and very stylish. After years of not really being too fussed about what I wear so long as it looked presentable, I’m trying to get some smarter items of clothing albeit more smart casual than smart – however thanks to my brothers wedding I will have a Thom Sweeney suit and a pair of Crockett and Jones Wembley’s in the armoury. I was wondering, seeing that you recommend loafers as good summer shoes whether they can be paired with shorts and a shirt/polo shirt maybe or if they’re best paired with trousers? If so, have you any recommendations as to what sort of pair to go for – I’ve seen that suede is regarded as a more casual material. Thanks for the reply Simon, maybe something along the lines of these by Church’s then? http://www.church-footwear.com/uk/en/collection/men/A13309VEF0AAD Your website has some excellent advice on it, all a bit of a minefield for someone new to all of this but really useful. I am thinking about buying espadrillos from Zabattigli. The Haberdashery is selling them both with roped soles and with rubber soles. What is the differences and what would you recommend? The rubber sole version will be more versatile, can be worn for longer on a greater range of surfaces, and so on. But for me, the pleasure of an espadrille is the pure roped sole, that is surprisingly nice on the sole of the foot, and creaks when you walk. As I thought. The AS Haberdashery only have the rubber sole version in my size for the moment. But I guess they will stock up later in the spring. I’m having a hard time filling the gap between something like a driver and a formal loafer in my wardrobe. I’ve taken your advice about not wearing drivers outside to heart (my pairs are on their last breath because of that) but now I feel that I lack something that could pair with shorts/jeans/chinos on a hot day. Do you have any particular suggestions for the more casual end of the loafer spectrum? My wardrobe is also in its infancy right now, for whatever that’s worth. Just wondering what were your thoughts on the classic Gucci horse bit loafers ? I have seen quite a few very well dressed Japanese gentlemen pairing them well with relaxed Napolitain styled suits. The style isn’t for me, but I can see why some people like them. Understand where you’re coming from. Thank you very much for everything ! What socks (if any) can you wear with loafers? Thanks.